The Waqf, which administers the Temple Mount, says the Rambam Gate Bridge must stay despite reports it is unstable. The Waqf (Department of Islamic Endowments in Jerusalem) rejected an opinion by Jerusalem's city engineer that the Mughrabi Gate Bridge, which links the Western Wall Plaza to the Temple Mount, be demolished. Earlier on Tuesday, Jerusalem city engineer Shlomo Eshkol said the bridge to the Mughrabi Gate, also called the Rambam Gate, was structurally unsound, posed a risk to human life, and should be dismantled within 30 days. 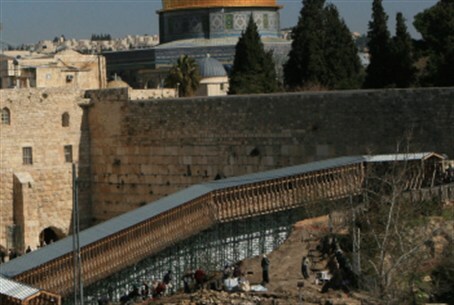 Eshkol informed the Temple Mount Heritage Foundation that the bridge, constructed from wood, should be replaced with a structure designed by a competent engineer and made of non-combustible materials. Israel’s courts have already approved a request for the construction of a new, wider bridge that would allow police easier access to the site during riots by muslim worshippers, and stone throwing incidents, which occur there periodically. The Waqf, however, insists the final decision in the matter is theirs, as they regard the Temple Mount as a Muslim sanctuary under their sole authority. No one else, they claim, has a right to interfere or monitor their affairs. Israel, in sharply criticized and unpopular decision often associated with Moshe Dayan, has allowed the Waqf to administer the Temple Mount following the 1967 Six Day War. But the final decision on the bridge's future lays with the Israel police and officials in Jerusalem. Over the years Waqf officials have systematically pursued a policy of obstructing Jewish access and worship to the Temple Mount, refusing to allow necessary repairs to preserve the holy site, blocking access to archeologists, and allowing the wholesale removal and destruction of Jewish antiquities linked to the site by Arab construction companies employed to work there. Observers say the Waqf's refusal to accept Eshkol's report may be an attempt to force the bridge's removal, or eventual collapse, without it being replaced by a more permanent structure. The bridge has been a focal point of dispute between Jordan, which is tied to the Waqf, and Israel in recent months. In June, UNESCO endorsed a Jordanian petition to censure Israel over archeological excavations at the Mughrabi gate, and the bridge itself. UNESCO failed to censure the Waqf for the wanton destruction of Jewish antiquities or limiting access to non-Muslims at the site, however. "The Jordanians lied to us and to the Americans in an unbelievable way… The most astonishing thing is they don't even mention the agreement between Israel and Jordan," Israel's UNESCO ambassador Nimrod Barkan said at the time. The Temple Mount, where both previous Jewish temples stood, is Judaism's holiest site.